Progress Wed 30th October 2013. Despite the recent hurricane quite a pleasant day with 3 customers enjoying steam driver experiences at Wirksworth and on the incline. LMSCA were present working on the new seating in the SK and more preparation work for painting the LMS 3rd open. Buffet was open for business and the booking office was inundated with Santa bookings. Shottle platform builders moved a big step forward with another 60 ft of copings installed. 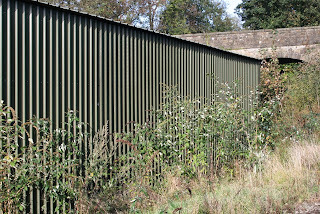 This platform is now looking brilliant and was the right decision to use the original material with additions from Duffield to maintain the correct look bearing in mind the station building, which is in the ownership of Peak Oil, has been maintained over the years retaining the Midland architecture - the only building on the line with the original style barge boards made and installed by Peak Oil and a credit to them. There remains 2/3 days work to complete the coping installation at which point we should be able to re route the trains back through the platform. P Way have been busy all day digging holes for various reasons at Shottle probably one to bury me in if I ask for any more to be dug. A fairly pleasant sunny day but a twinge cold and wet towards the end. We pottered up and down with the half-term passenger service and we will do so again on Thursday for those of you looking for a little light entertainment this week. days. In the shed the Third Open occupied the attention of the LMSCA and the DMU team pored over a visiting railcar 55012 which is receiving attention here for a variety of interesting and unique issues. Down the line the track was duly patrolled along with an offering of cows and the VCT carried on with steady work whilst possibly contemplating a new dent in Alan's car, or perhaps a dent in Alan's new car. At Duffield the autumn tranquillity was broken only by the thundering of main line trains and the thundering of the platform leaf sucker. Back at Wirksworth, the Jonathan Ross team undertook a severe tidying up of the Ballast Dock, and the pile of ballast is now more or less all in the same place, to its considerable surprise and ours. All we need now is a little more care in the parking of caravans and the Dock would be positively neat once again. A surprisingly sunny and pleasant start to the day had only deteriorated slightly to occasional moist moments as darkness fell here in the Peak. The sunny start encouraged a bit of painting, and as we had a couple of Duty Conscripts they indeed did a bit. The passenger service tootled up and down in a leisurely sort of way but we didn't break any records in the circumstances. Down the yard a small gathering addressed the brake gear on the Austerity and fitted some locker doors in the LMS brake van. In the shed, the DMU team carried on with the cab electrics of unit 50253 and also with the sanding of its woodwork and the fettling of the guards compartment doors. Special precautions were being taken to secure some of our more delicate equipment in the face of the forecast biggest storm since the last biggest storm and its associated media frenzy. Consequently the Tactical Action Response Team was put on standby in Bakewell, although there is apparently one working for Marks and Spencer in Ashbourne as well. Having therefore taken all due care we retired to the Whore and Trumpet (A Marston's House) in the hope of being blocked in for the night. A rather quiet but productive day down at Derbyshire's favourite branch line. Our scheduled services ran with modest passenger numbers. 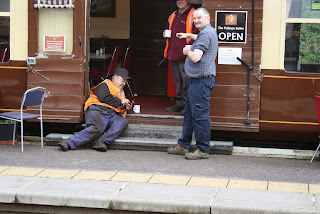 At Duffield the Station Foreman attended to potholes in the car park. At Wirksworth the 8F team continued their restoration of Catherine's boiler and a large contingent of DMU Team members concentrated their efforts on replacing ceiling panels. Five new volunteers attended their induction day and we wish them a long and enjoyable time with us. apparently delightful day all round and we even gained one we weren't expecting. chocolate to the top of the planned celebratory packet of digestive biscuits, paid for out of our multi-million pound profits. In between interminable phone calls from people wanting to sell us special cheap phone contracts and breathtaking advertising deals, the station repair team dealt again with the ever-expanding Gents door by taking another slice off it and fixed the closer of the Mess Room door so that we are not wasting precious electricity by heating the outside world. Today's photo is of a Maintenance Facility wall - not exciting but illustrates the replacement of fire damaged sheeting to the great credit of the contractor. I am often challenged as to why we have no money to spare but it is these events that conspire to absorb our meagre funds. A water pipe burst on the station approach road disposed of some £1500 at a stroke yet alone the water meter spinning around until we could deal with the problem. Some 250 fare paying passengers needed to deal with these two events! It was a delight to welcome Amey back on site as they start this year's structure survey programme and the VCT set off for their attack site north of Duffield for a little more cutting and burning. Further progress was made with the new table lights and fan heaters in the Pullman First Open and great credit to Mike Evans who doggedly cleaned the exterior of the work stained Pullman Buffet Car. The dmu team were keen to observe Mike's endeavours but finally undertook a proving run for 79900 and 51505 successfully. The PWT achieved recovery of insulated joints from Gorsey Bank, gathering of cabinets from Idridgehay and maintenance of ground frames at Duffield. The Pullman Buffet Car welcomed a number of visitors brought out by the winter sun and the Booking Hall benefited from a further pulse of Santa bookings. The team were poised for the arrival of "Bubble Car" 55012 which is visiting from the North Norfolk Railway to enjoy the unrivalled skills of our team to resolve some engine problems. Just looked on the web cams and the machine has arrived! I came to your railway on sunday 9th june on a day with a driver, i would just like to say that every one made the day very enjoyable, both the drivers Chris and Lewis went out of their way to ensure that the day was memorable, upon arrival we were made very welcome by the gentleman in the booking office (sorry dont know is name) ,the catering staff were excellent , nothing was to much trouble for them. I will be making a return visit and would recommend it as a great day out. After a miserable start the weather perked up as we welcomed Steam Experience guests and Drive a Diesel participants. Joe, JHT and John R hosted the steam people and a photo illustrates the team returning from an ascent of the Incline. 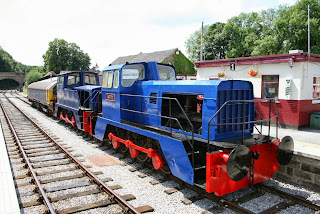 Richard and Lewis hosted the diesel team with the morning spent on the "Bubble Car" and the afternoon on the Class 33. The Pullman Buffet Car lunched the teams and benefited from a number of "followers" together with a few unplanned visitors. The PWT concentrated on Shottle with a sort out of coping stones that were an amalgam of undamaged ones salvaged from Shottle and Duffield. Given their age, from the 1860s sourced by the Midland Railway's contractors, they have been carefully assembled under the unused arch of the road bridge. Anyone appropriating them for any purpose other than the completion of the platform is likely to suffer a long and painful demise. The Booking Hall had another productive day as Santa sales continue at a satisfying pace online and a pleasant share sale lifted the spirits. Quite a bleak day if not too cold that contained a large number of activities. The PWT set off for Shottle to sort and cut some 3 tones of scrap permanent way, or not so permanent, to raise funds for future developments. The VCT also headed south to cleanse another section of the line just approaching the Duffield straight with two large fires and liaised with the Komatsu flailing as the lineside has been attacked towards the Holloway Road foot crossing. These catch up tasks are most welcome as running days over whole allow more access to areas that have had to have been necessarily neglected due to the volume of activity. 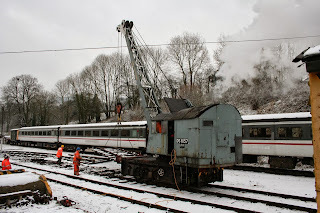 The dmu team tackled the unusual failure of Iris on Sunday and shunted the loco hauled stock to Platform 1 to allow the LMSCA to prepare for seat replacement in another compartment of their BR Mark 1 SK. The M1M completed reflooring at the south end of their Second Open and the Asset Manager, with some technical assistance, researched the battery failure on the Track Recording Machine. Progress was made with the fitting out of the Pullman First Open with tasteful table lights and the participation of the vehicle in the new Santa offerings. The LMSCA also made considerable progress with the re-roofing of the Third Open. It was good to see Henry Ellison back in traffic for today's steam experience customers who had a super day with thanks to Bob, Fred and John. The Pullman Buffet Car looked after today's experience customers together with the train crew and the Booking Hall continued to service a satisfactory number of online bookings as well as hosting a Santa planning meeting. The Filing Fairy was in assertive mode as she drives our compliance with competences forward. 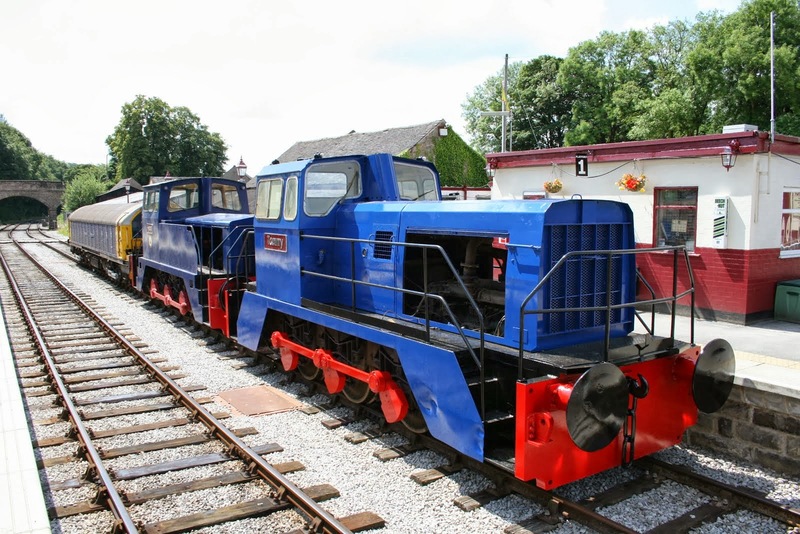 PS - Today's photo is a reminded that we hosted an UIC (European) gauge vehicle that was the precursor of the UK gauge vehicle which spend some time with us last year. Platforms and bridges provided some obstacles for the vehicle illustrated. A surprisingly mild October day here in Wirksworth, though with thunder over the Peaks. We pottered around with the service and did modest business for the time of year, although we were sadly plagued with cows in several places. In the shed, the LMSCA, who weren't plagued with cows, cut the toilet window sections out of the newly panelled south end of the Third Open and welded the central section of the south end roof. Nearby, the DMU team were all over newly arrived unit 50253 like a rash, having taken a rest after their efforts restoring the class 119. 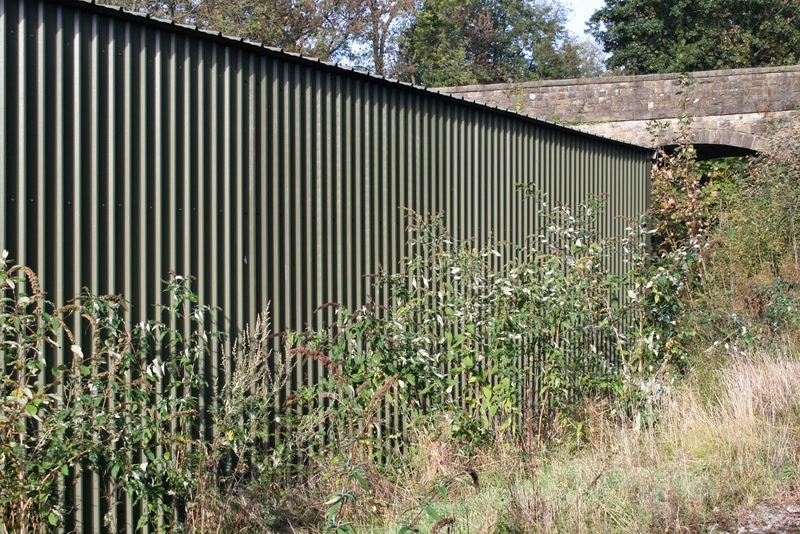 Various parts of the cab were being soldered by the Stokes Field Conglomerate in the Mess Room; Village Green restored one of the guards doors to its former glory and a select band of Belper natives renewed two ceiling panels in the guards compartment which had suffered an excess of limpness during the units stay at a nearby railway the other side of Heage. A rather wet and dreary day but the sun did make a brief appearance before the thunder storm! Down the yard the contractors successfully repaired the fire damaged to the maintenance shed. The 8F group, LMSCA and Oak's Enterprises continued their respective restoration projects. A large continent of the DMU team completed a range of tasks including a thorough steam clean of 50253 (the Strathclyde livery does evoke memories), removed rotten ceiling panels in the guard's van, completed the cab wiring and shot blasted the guard's van locking mechanism. The Railway's Association held its Annual General Meeting at the Red Lion Hotel which was well attended. Our scheduled services ran with modest passenger numbers and I believe we had our first through ticket customers from London St Pancras International station today which does illustrate the potential of through ticketing. A day of rather low cloud, but we were quite happy under it, as we often are. A large contingent of Driver Experience guests, both steam and diesel were entertained, as were a rather larger contingent of relatives, friends, neighbours and other passing citizens. Down the yard, the LMSCA occupied themselves with a day of screwing the side panels onto the Third Open and this vehicle continues to make satisfying progress. At Duffield the newly privatised* EVR postal system was delivering a wide variety of interesting literature but then went back to gravelling the car park. * Privatisation: Definition: "To sell off land and buildings to our mates". A more gentle day without too many distractions but lots of progress! The PWT returned to Shottle to tend to the north end loop points as the lengthy process of adjustment and manufacture of the component parts gradually come together. 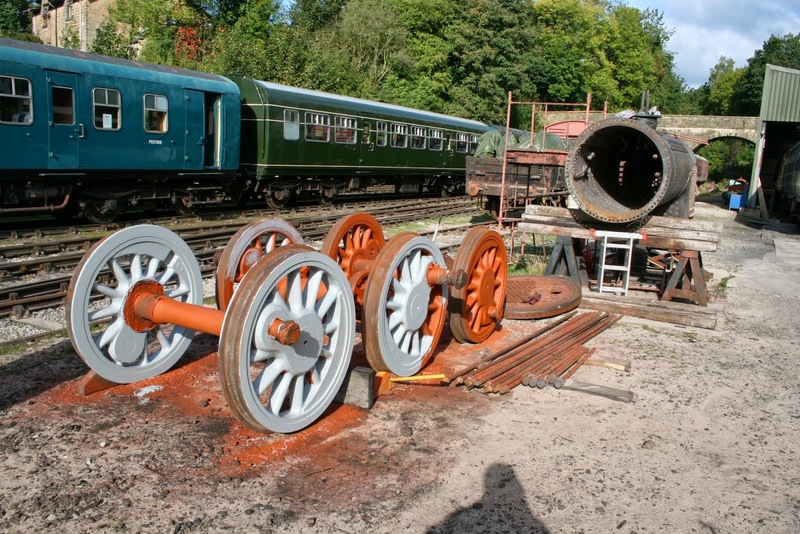 The dmu team were out in force with further work to one of 51505 vacuum cylinders seem to cause the main member of the team to need to lie down. The active part of the team tended to roof leaks and a wash down of 55006, the "Bubble Car". 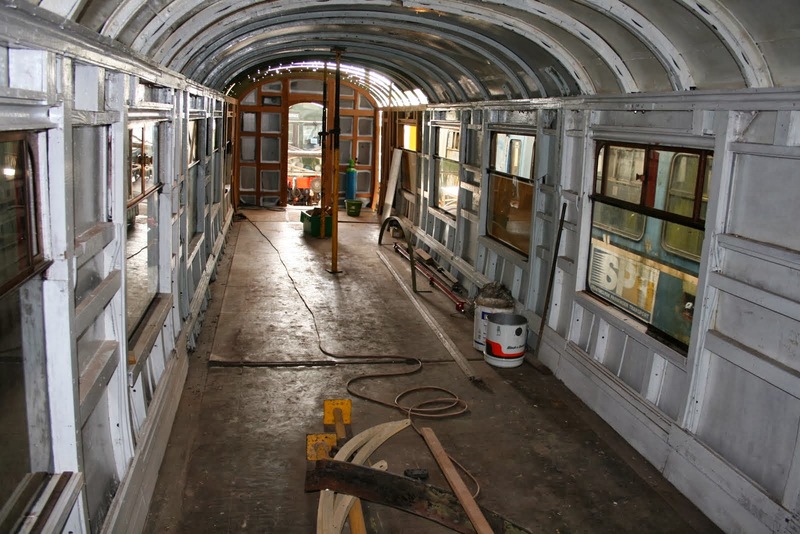 The head of the team responded to pleas to try and remove the staining on the exterior of the Pullman set and made great strides in restoring the vehicles to their former glory. The project to provide table lamps and interior fan heating within the Pullman first open commenced as the vehicle is integral to the Santa programme. The Pullman Buffet Car benefitted from cyclists that seem to have found our catering to their liking. Their return to Chesterfield after a Pullman lunch doesn't bear thinking about. The Booking Hall continued to tend to Santa and Footplate Experience bookings that bode very well for the future of our enterprise. hello from Sydney, at long last back in the routine of work and catching up on everything here, nothing overly exciting, plenty of bills to pay off and everything else you have to do to keep things rolling along! Well, where to start! A huge "Thank You" to you and the team, the team of John's and Rodney for his wonderful tales and insights! For making Friday the 21st. June such a special day for me and my friends, and Ella the Lab! I know from the other people who were part of the day, as they stayed at the Red Lion too, had a wonderful time, as we relived the day over breakfast the following morning, and the Scottish Gent from Glasgow was speechless after the class 31 session! What made it special was so many things coming together seamlessly, and the flexibility of being able to accommodate everything. When I first started looking into my 2013 day, I had a number of railways in mind, but some are quite far, although fine for me, as it is a holiday and travelling go hand in hand, it is not so easy for friends to join in, what with work and families, and being a Stockport native, the proximity was perfect, as days out to Buxton and Matlock have long been an institution for weekend drives and rides out on mopeds back in the day, Derbyshire, Pennines and Goyt Valley are some of my favourite places, so the railway became the perfect choice. The booking through Buy-a-Gift was straight forward and the feedback written about the railway and staff was extremely positive, and I have to say, everything said was true. Dealing with your good-self on my DMU requests was a pleasure, and you kept me informed of the progression of the day planned, and the reality surpassed the expectation, the only change was that we were unable to use the Ravenstor Incline, as the Steam gang were using it on the day, then unfortunately, the loco broke down and was unable to be moved, but we made up for it by some extra time on the class 31, and propelling the guards van from Duffield to Wirksworth, was an unusual high-light indeed, and made for some great filming and views of the line for all! My friend and I arrived late in the afternoon the day before, to have a nosey around the yard, as I just had to see the place in the flesh, and I wanted to make sure I would be in the right place at the right time, and I asked if I could take some photos, well nothing was to much trouble and Rodney gave us a quick tour before you had to close-up, which I thought was a nice touch, nothing was to much trouble, as I love first generation DMU's, and to be able to get up-close to them, just for a photo, is a gift in itself, thank you all again for that, I left for beer back at the pub with the taste of Diesel in my nostrils! Come the following day I was waiting for my friend John, who has a caravan nearby, John has a companion dog, and he arrived a touch past ten and missed the initial brief before we headed out to the carriage shed, to see the workings of the railway and the team up close, thankfully, this was no problem and John and Ella were soon with us, I was concerned for Ella, as I hadn't asked about dogs, as I didn't realise till the day that he had brought her, as sometimes he has her at a doggy wash, but as he was down at the van for three days, he couldn't leave her, but welcomed she was! There was also a gentleman on the course with his wife, who were also at the Red Lion, he was suffering from a painful leg condition, and he was having all sorts of trouble here and there, and I am sure that some places may not have allowed him to participate, but the staff and the rest of us, helped him up when he needed it and he was able to fulfil everything he had set out to do, again, great team work from those involved, and I know, because we had breakfast together, that he was touched and over the moon with being able to fully join in. I will be planning my next trip in the New Year, once Christmas and all holidays are over and things settled down a touch, at this stage, what with the changes that my work is going through (Qantas-The airline is going through a shake up), I may be back in late May till late June, or late Sept till Oct, so I was wondering if something could be booked Martin? I had some ideas and then I checked and found all the new courses! Wow, like my mind had been read! 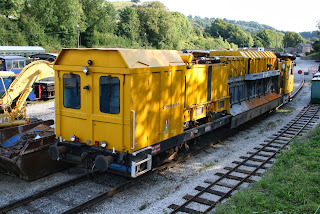 I was going to enquire about hiring the railway to do a days DMU course, and wether it would be possible, pending traffic status and yard logistics of the vehicles, to drive a mixed rake-class/hybrid set, so I can tick-off some classes that I once saw and rode upon in the flesh, and spread the goodwill amongst the owners/groups? I love driving locos, please don't get me wrong having driven Weybourne's 31, and the Deltic at East Lancs in 2010, but DMU's are so hard to find courses for, that when one comes up, to stay on it for the duration is magic. 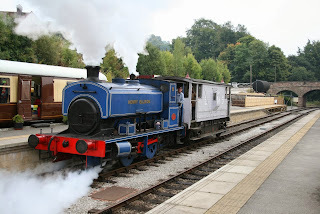 I was able to book a day on the Churnet Valley last year, and was able to drive the class 104-110 three car set, with Roger as my tutor, that really got me hooked! So a dedicated DMU course would be the bees knees indeed! Ultimately I will find myself back in England for a while in the near future, as I have to complete 25yrs in Australia to comply with laws regarding pensions and other legal stuff, and I have about three years to go, Mum and Dad are not getting any younger and sadly we lost my one and only Brother, quite suddenly, last year, and being no one else, I consider it my duty to make sure they are ok, as my Brother lived close to them in rural Lincolnshire, but that has all changed now. Being back would allow me to be more involved in many things, and having an interest in railways, would provide me with the things I miss out here, eventually I would love to own/share a railcar, be qualified to drive it and be involved with the day to day running of a railway. I have no idea of whats involved with the purchase of a railcar, how it works between the railway and its owners, insurance, servicing and maintenance etc, but it must work hand-in-hand, or no railways would be operating as they are, and no preserved stock would have anywhere to run! It's a long thought I know, and one for the years ahead, but it is something that I am truly interested in. A very mixed and satisfactory day with Steam Experience participants and guests enjoying their time with us despite some of the worst weather of the year. Comments from last Monday's Drive a Diesel Day also warmed the cockles and showed that these activities are really appreciated. A brief note on behalf of Patrick, David, Chris and myself to express our sincere thanks for everyone's efforts to make yesterday's driving experience on 33035 so enjoyable. Notwithstanding the awful weather we all had a great time and in truth it didn't really mess up the day  we all felt sorry for Richard and Lewis for having to go out in such conditions when the cab was (generally!) warm and cosy. Our thanks too to the catering team and yourself and Anton, but of course particularly to Lewis and Richard whose efforts made the day a resounding success and to whom we are very grateful for their time and effort. 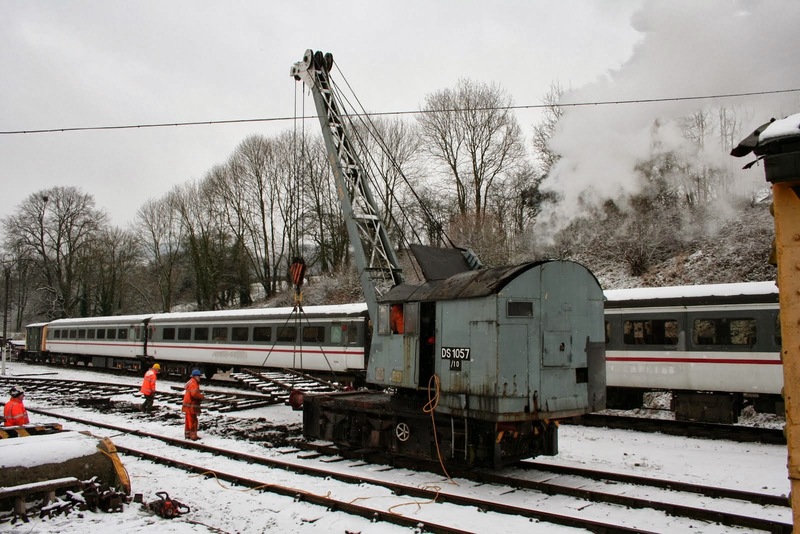 Please pass on our sincere thanks and say we hope the engine still works properly after our miserable efforts to try to be a train driver  as with everything a lot more skill needed than at first seems to be the case. Once again all our grateful thanks and, who knows, we may yet see you again. We enjoyed the company of an Australian test customer who had air freighted his machine at significant cost to meet with Network Rail and their approvals team. Their were glows of satisfaction indicating we had played our part in a successful session and my thanks go to Mick Thomas who fronted our contribution. The Filing Fairy was in attendance further updating our records and there was a track patrol to cover the last part of the enterprise between Idridgehay and Wirksworth. There was much activity at Shottle that will be revealed tomorrow. The dmu team completed the winterisation of the fleet yesterday and concentrated on the newly arrived vehicle today. The Pullman Buffet Car benefitted from the visiting test customers after wrestling with an Australian credit card - you hold them upside down! The Booking Hall has been overwhelmed by Driver Experience and Santa bookings which is very warming. An initiative to test drive Driver Experiences on eBay is a fascinating development and a wholesale revamping of the railfilms site owes great credit to Leigh and Robin. A reminder from the Head of Security that the main gate to the station approach at Wirksworth with be shut and locked at 1800 hrs each day. 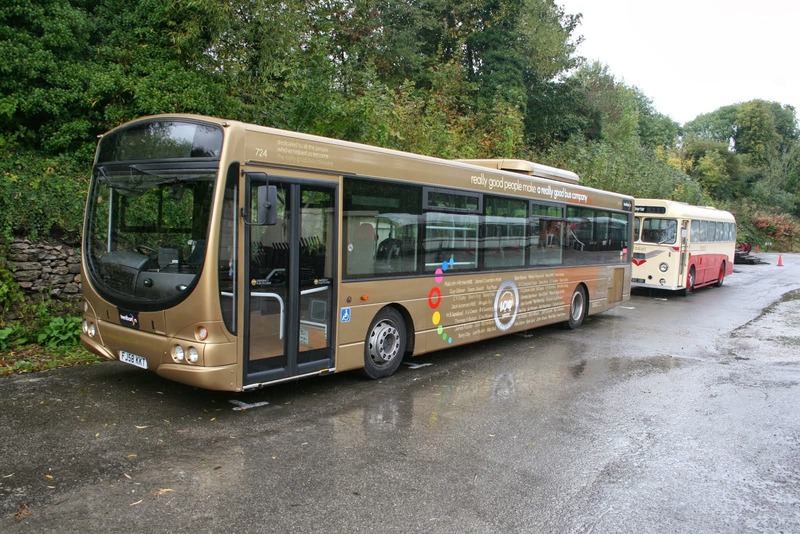 Due to a cancellation, the system has priced a Bronze Drive a Diesel Day at £99! The date in question is next Friday 25th October and this price is only available on our website. Just the one available so book online at www.e-v-r.com/experiences . A slightly disjointed report as I have been waiting for the gas man to repair our central heating boiler with a successful outcome as Mrs Miller will be warm this evening! Nonetheless our steam team rose to the challenge of one loco failing and being substituted by another that entertained today's driver experience customers. My thanks go to Bob, Fred and John Ball for keeping the show on the road. Fred & Iris attended to the Mess Hall and the winter flower beds. The dmu team were working on the Class 108 and Centre Car heaters as Santa approaches. The PWT fitted stretcher bars to the north loop points at Shottle and then removed them again for fine tuning in their Wirksworth workshop. The SBT achieved further concreting and the PWT patrolled Duffield to Idridgehay, the Incline and southern headshunt of Road 1. The Asset Manager and his new recruit, Norfolk Dave, traversed the Idridgehay to Shottle section with the track measurement trolley. Mike Billings made significant strides with the flail between Hazelwood and MP 134 1/4 with the VCT cleansing the trackside in that area with two large fires. The Pullman Buffet Car picked up the passing trade and the Booking Hall processed an ever growing number of online bookings. Anton's attack on the good people of Ashbourne is really paying dividends! John Allsop visited on Friday after some serious knee surgery and is making very satisfactory progress that should see him return to the fold in the very near future. I must offer my thanks to yesterday's team who working in the most difficult conditions to entertain our Drive a Diesel clients together with the Bus Company Directors hosted by Trent Barton. Special thanks to Anton who held the fort from Friday through to Monday which were four days of unremitting rain depressing the most resilient of humble servants. Today's photo is of Cathryn's blasted bits. Well, its October, so we were wet again, very wet and for almost the entire morning. The sun briefly made an announcement over the south of the line about lunch time, which happily coincided with a charter by our friends from Trent Barton Land, the participants for which remained almost miraculously dry for their visit before being whisked off in two buses, a vintage one and the Trent Barton Centenary Bus. 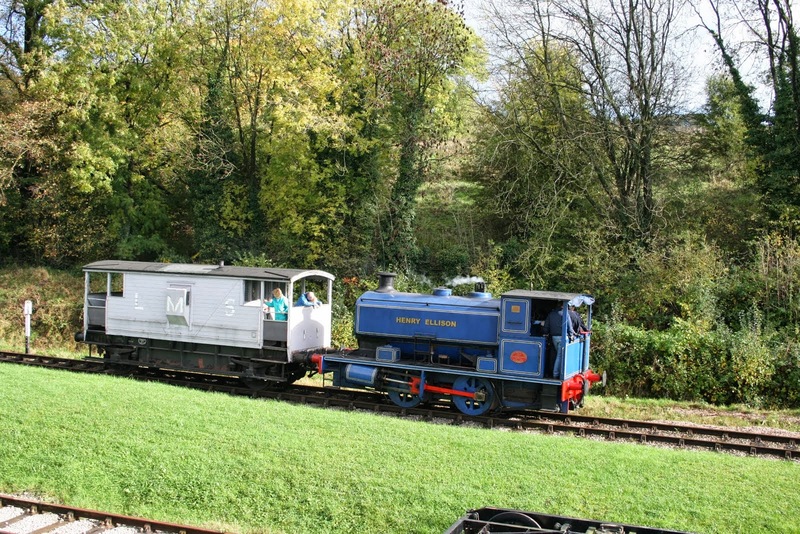 Meanwhile, four guests experienced a Drive a Diesel Day and a tour of the yard, again in the brief moment between one torrential shower and another. A photo of the transport provided for today's visitors. steam cab rides did as well as could be expected in rather dreary circumstances. Down the yard, C Lings struggled valiantly with the decking, sorry the new working platform structure in the shed, the only non-event activity taking place during the day. In due course we retired to the Whore and Trumpet (A Marston's House) to dry out. Well the rain and the wind decended on Derbyshires friendly railway as the Model railway exhibition got underway in the Town. The 3car unit looked after the Duffield - Wirksworth as the Bubble car 55006 looked after the Ravenstor line. Henry Ellison stood in for the failed No3 Brian Harrison providing the drive a steam train service out of platform 1. Down the yard Chris and John were to be found building the downside walkway in the shed. The Buffet car did brisk business from the hardy souls who also braved the rain. MY thanks go out to all staff who braved the rain to provide a wonderful service as well as the staff who have toiled over the last few days to provide an excellent model railway exhibition in the town . Autumn weather was a main feature of today here in the Peaks, but this didn't dampen the spirits of our various driver experience guests, both on the steamer and the diesel, and it also didn't discourage a surprising number of random buffet visitors either. was going into the various halls around the town for the Annual Model Railway exhibition, which takes place this weekend, and we hope many of you reading these annals will attend it. Down the yard a mahousive crane appeared at sunup in order to lift the frames of the Austerity, this being done under the supervision of Oakes Enterprises, and a great deal of accumulated frame gunge was dealt with in the process. In the class 108, which has been much caressed by the DMU team over the last couple of weeks (new seats, bulkhead Formica repaired, bits of trim fixed, antimacassars renewed), the main theme of the day was caulk. A hole in the ceiling was patched by Ollie on Tuesday but this wasn't quite finished to the desired standard due to the lack of caulk to fill the gaps. This is known as Ollie's Caulk Problem. Today Ollie's Caulk Problem has been treated using the Passenger Department's caulk, as the DMU team never seem to have any caulk unless they've been to Crewe for it. The resulting finish is naturally very splendid, and we mopped the floor afterwards at no extra charge. The PWT concentrated on the facing point lock on the north Shottle Loop points as part of the process of preparing for the eventual passing of trains there. There was much activity by the dmu team as they refiled their fleet after the sand blasting of Cathryn's bits. The weekend's 3 Car set was fuelled and prepared for what we hope will be a good two days of earning. The impending Model Railway Exhibition occupied Pat as she assembled many items for sale and the M1M flitted between the SK and SO with the frightening site of legs dangling underneath the SO as flooring issues were addressed. The Pullman Buffet Car had quite a thin day as did the Booking Hall in terms of foot fall but there was much progress in the Booking Hall towards our new range of driver experiences that are now available on line. Today's photo shows how the LMSCA are progressing with the Third Open reflecting a very high standard of work that will return the coach to service within the foreseeable future. Hi Martin I hope you are well. 1 Apologies to all at Wyvern Rail for not getting back to you sooner to say a big big thank to all concerned and you for the fantastic time I had on 20.09.2013. 2 To confirm as a result of 1 above I am spreading the word about Wyvern Rail and what a great day out it can provide.
" On 20.09.2013 I had the good fortune to enjoy a Steam Train taster session at EVR preservation railway courtesy of Wyvern Rail PLC at Wirksworth Station in Wirksworth Derbyshire. It was a fantastic day learning to drive a steam train in the lovely setting of Wirksworth in the Peak District. To say this is to be recommended is simply not doing justice to the day. Try it for yourself you will love it. Gareth Jenkins Warwickshire." A change in the weather as we went from a pleasant morning through to a bitterly cold afternoon. None the less today's steam experience customers included John Lennon! All were delighted by the hospitality shown by our team. The LCC cleansed the 3 Car set for the weekend and the overhead luggage racks of the Pullman stock ready for Christmas decorations! The PWT set sail for Shottle and the south to, amongst other activities, gather two wagons of logs for sale at our Shottle private siding. The Head of Gardening was in evidence and transferred the majority of her debris to the burning site at Cemetery Lane. The Pullman Buffet Car benefited from today's experience customers together with a few hardy souls braving the north wind. The Booking Hall worked on the new Timetable and Experience Leaflets and we have finally bottomed a schedule for next year that will cope with the likelihood that trains may be able to pass at Shottle sometime in 2014 - not as easy as it seems as Shottle is inconveniently not the mid point of the line. PS - a blast from the past in the age before the Komatsu and demonstrating that work carried on in all weathers. The year was 2007. A remarkably pleasant day resulting in an unexpected number of visitors to support their relatives participating in the Steam driver experiences. These were ably handled by Neil Hardwick, Dave Williams and Eric Hills with many rewarding comments after their time with us. The Pullman Buffet Car dealt with all comers and had one of their better Tuesdays. Fred & Iris cleansed the Booking Hall and moved onto their new responsibility for the Wirksworth Station flower displays with the planting of winter pansies. Cathryn benefitted from further attention by the travelling sand blaster who completed work on the boiler and cab. This was in addition to the DST undertaking a monthly check on Henry Ellison, repairing the back door to the Maintenance Facility and further dismantling of Cathryn's frames. The LMSCA concentrated on the Third Open with more sliders fitted, a final fix of the new panelling and preparation for refitting the gutters. There was much sorting of products for the upcoming Model Railway Exhibition and the VCT had a generous fire in the area of MP 134. The PWT and SBT achieved a further 50ft of coping stone installation, the digging of the hole for the north loop ground frame and remedying of some erosion that had covered existing point rodding. The dmu team completed the re-installation of a partition in the Class 108, continued to ensure that power was reaching the centre car of the 3 Car set and much good housekeeping. This was after moving all their stock away from the sand blasting activities. 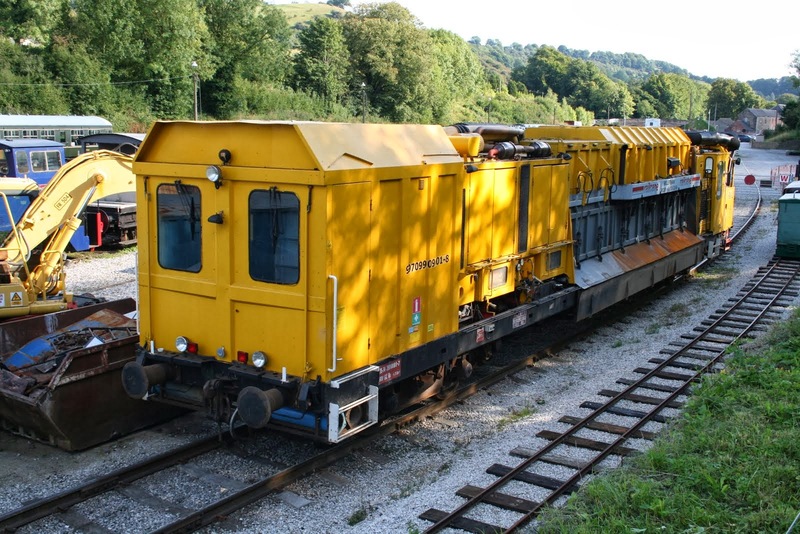 The road/rail dumper was modified with the aid of the DST to enable the bridge inspection platform to be fitted. Lighting was fitted to the platform extension at Wirksworth and the lighting engineer was last seen wrestling with the urinals at Wirksworth representing the most dedicated of volunteers. The Booking Hall received today's experience guests and after dealing with the accountancy associated with the previous 7 days went on to create the first proof of a new Driver Experience leaflet. PS - a slightly fuzzy photograph taken by a third party of a very suspicious character holding a dog in a pink holdall. Does anyone know this man? A delightfully lovely and exquisitely quiet autumn day in which to potter about with our passengers and a day with a Driver guest. The main thrust of the day, given the weather, appeared to be gardening. stores than when they went in. Down the yard, the LMS brake van, now in the final stages of the most marathon paint job I have ever seen, is about to receive its lettering and have its handrails painted. Given the effort which has been expended, the lettering is probably likely to say "Wipe your feet". achieved was mainly due to the efforts of Jenkins the Fence. source that the Mess Room of the Gloucestershire Warwickshire Railway was strangely full of unwashed mugs for a Sunday. A steady day down at Derbyshires Friendly Railway as 55006 trundled up and down to Duffield whilst Iris service the Ravenstor Line.Neil held a marketing meeting up in the Red LionThe 8f group held their annual meeting .The Dmu group where absent as they attended a Dmu convention The 33 locomotive carried out some successful trials on the incline much to the delight of a railway blogger who was given a cab ride and thought our railway was one of the best he had visited for its friendly staff.MY thanks to all the staff who again made it a special day for all. A day of torrential downpours saw us chuffing up and down with some damp but happy steam experience guests, closely followed by a charter group who are spending the weekend at a number of heritage railways in our area, starting with us. Down the yard, work took place on the compartment doors of the CK, and the LMSCA carried on with the side sheeting of the Third Open in the relative dryness of the shed. The Station Foremen managed to use the dry moment before the heavens opened again to carry out the monthly inspections of our far flung estate. As far flung as Ravenstor that is. It was good to welcome a team from Network Rail on a team building day using the Training Room durin the morning, enjoying lunch in the Pullman and having a run down the line this afternoon. Thanks go to Graham, Eric Hills, John Tedstone and Bob Swepstone for looking after this part of their day. The VCT had a short day due to the charter but managed significant progress in the area of MP 134 cutting and burning a lot of lineside detritous. The small team of PWT undertook some flailing and a cleansing of the Shottle Mess Room which I understand had got in quite a state! New seats were installed in L J Breeze which had been recovered from the late lamented "Tommy". The Pullman Buffet Car, in addition to looking after our Network Rail guests, had a steady stream of visitors and the Booking Hall benefitted from a steady footfall through the day. Behind the scenes work included some tweaks to the web site and further development of the planned coach and bus operators visit a week on Monday. PS - a reminder of how Tommy looked after a cosmetic overhaul by Roy & Les. Unfortunately its mechanical problems were way beyond us and it departed for a new career via the LH Group. Another busy day as we entertained both Drive a Diesel Day customers and Steam Experience people. My thanks go to Lewis and Richard who masterminded the diesel folk and Neil, JHT and Eric Hills who ensure the steam participants were cared for. The LCC cleansed the Training Room, Iris and the Mess Hall and, again, I am grateful for this essential effort on our behalf. The PWT arranged a track patrol between Wirksworth and Idridgehay together with carefully placing more coping stones on Shottle platform. The Pullman Buffet Car tended to our experience guests and benefited from a number of relatives and friend they brought with them. The Booking Hall processed a variety of on line bookings which helped to swell today's coffers. Weather miserable but spirits in good shape. Progress Tuesday 1st October 2013 Extra! Bob is not a Gibbons but a Gibbens! A happy Fred Courts is pictured co-hosting today's experience customers. Difficult to believe we have reached October but we have and a concentrated effort is being made to deliver all our obligations for driver experiences which will see them operating three days a weeks until the end of the month. Today saw a Steam Experience day hosted by Bob Gibbons, Fred Court and John Ball with two all day participants and one afternoon "taster" session. All seemed pleased with their time with us and observed much other activity through the day. The dmu team retorqued the cylinder heads on Iris, gave 55006 an "A" Exam, dealt with the cab wiring on the new arrival 50253 and steam cleaned the seats on 50599. The VCT dealt with areas south of Hazelwood and Mike Billings flailed areas of concern at Gorsey Bank and Idridgehay together with sundry other locations as he headed for Shottle. The LMSCA sanded further areas of the Third Open, installed more windows and "dry fitted" its guttering. The DST saw Cathryn's frames placed into the Maintenance Facility and sundry parts of the locomotive tidily assembled around them. No 3 was prepared for tomorrow's driver experience. The M1M continued their endeavours with the EVRA SK and SO. Track patrols operated between Idridgehay and Duffield and the Pullman Buffet Car satisfied many demands including or driver experiences and a large number of followers. The Booking Hall concentrated on Santa bookings and we welcomed the Commercial Manager from Trent Barton which lead to a number of joint opportunities for 2014 - all most encouraging.